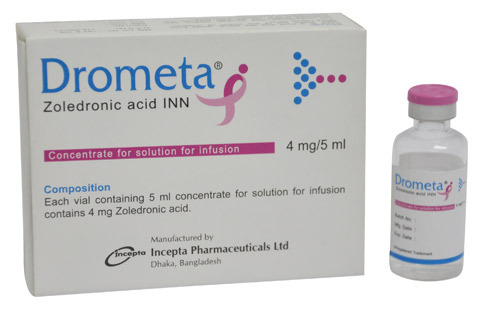 Drometa (Zoledronic acid concentrate for solution for infusion) Injection: Each vial with 5 ml concentrate contains Zoledronic acid INN 4 mg (calculated as the anhydrous form, corresponding to 4.265 mg Zoledronic acid monohydrate). Zoledronic acid belongs to the class of nitrogen-containing bisphosphonates and acts primarily on bone. It is an inhibitor of osteoclast-mediated bone resorption. The action of bisphosphonates on bone is based on their high affinity for mineralized bone. Intravenously administered Zoledronic acid is rapidly distributed to bone. The main molecular target of Zoledronic acid in the osteoclast is the enzyme farnesyl pyrophosphate synthase, but this does not exclude other mechanisms. Clinical studies in tumour-induced hypercalcemia demonstrated that the effect of Zoledronic acid is characterized by decreases in serum calcium and urinary calcium excretion. In addition to its inhibitory activity against bone resorption, Zoledronic acid also possesses anti-tumour activity, anti-angiogenic activity, anti-pain activity, cytostatic and pro-apoptotic activity on tumour cells and synergistic cytostatic effect with other anti-cancer drugs. There was no accumulation of the active substance in plasma after multiple doses given every 28 days. Zoledronic acid is not metabolized and is excreted unchanged via the kidney. • Drometa is indicated for the treatment & prevention of skeletal-related events (pathological fracture, spinal cord compression, radiation to bone or surgery to bone) in patients with advanced malignancies involving bone. • Drometa is indicated for the treatment of patients with multiple myeloma and patients with bone metastases from solid tumors (breast cancer, prostate cancer, lung cancer, and other solid tumors) in conjunction with standard anti-neoplastic therapy. The maximum recommended dose of Drometa in hypercalcemia of malignancy (serum calcium 12 mg/dl or 3.0 mmol/l) is 4 mg. The 4 mg dose must be given as a single-dose intravenous infusion. Dose adjustment of Drometa is not necessary in treating patients for hypercalcemia of malignancy presenting with mild-to-moderate renal impairment. Re-treatment with Drometa may be considered if serum calcium does not return to normal after initial treatment. It is recommended that a minimum of 7 days elapse before re-treatment, to allow for full response to the initial dose. The recommended dose of Drometa in patients with multiple myeloma and metastatic bone lesions from solid tumors is 4 mg infused every 3-4 weeks. Patients should also be administered an oral calcium supplement of 500 mg and 400 IU of Vitamin-D daily. Prior to administration, the required amount of concentrate from one vial must be further diluted with 100 ml of calcium-free infusion solution (0.9 % w/v sodium chloride solution or 5 % w/v glucose solution). The duration of infusion must not be less than 15 minutes. After addition of the solution to the infusion media, the infusion solution should be used as soon as possible. If storage of the infusion solution is necessary, hold at 2-8 ºC for not more than 24 hours. If refrigerated, the solution must be allowed to reach room temperature before administration. Drometa must not be mixed with calcium or other divalent cation-containing infusion solutions, such as Lactated Ringer\'s solution, and should be administered as a single intravenous solution in a line separate from all other drugs. The post-dose side-effects are headache, nausea, anorexia, fatigue, osteonecrosis of jaw, anemia, bone pain, constipation, fever, vomiting, flu-like syndrome, hypocalcemia, myalgia, arthralgia and hypophosphataemia. Patients must be appropriately hydrated prior to administration of Drometa. This is especially important in the elderly and for patients receiving diuretic therapy. Adequate hydration can be achieved by the patient drinking two glasses of fluid (such as water) before and after the infusion. Serum levels of calcium, phosphate, magnesium and potassium, as well as serum creatinine should be carefully monitored after initiating Drometa therapy. If hypocalcemia, hypophosphatemia or hypomagnesemia occurs, short-term supplemental therapy may be necessary. Moreover, careful renal function monitoring should be considered. Zoledronic acid is contraindicated during pregnancy and in breast-feeding women. It is also not recommended for use in children and adolescents below 18 years of age.